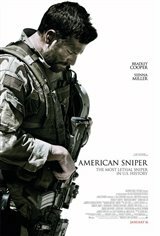 Texas native Chris Kyle (Bradley Cooper) becomes a Navy SEAL, and during his time in the service, records the highest number of sniper kills for an Americanmore than 150 confirmed kills. Meanwhile, his wife slowly watches as her husband's affection turns from her to the SEALS and the war. Based on the memoir by Chris Kyle.